As one of Canada’s foremost mountaineers, Gabriel Filippi has summited the highest peaks of six of the world’s continents, and is only the second Canadian to climb both of Everest’s faces. 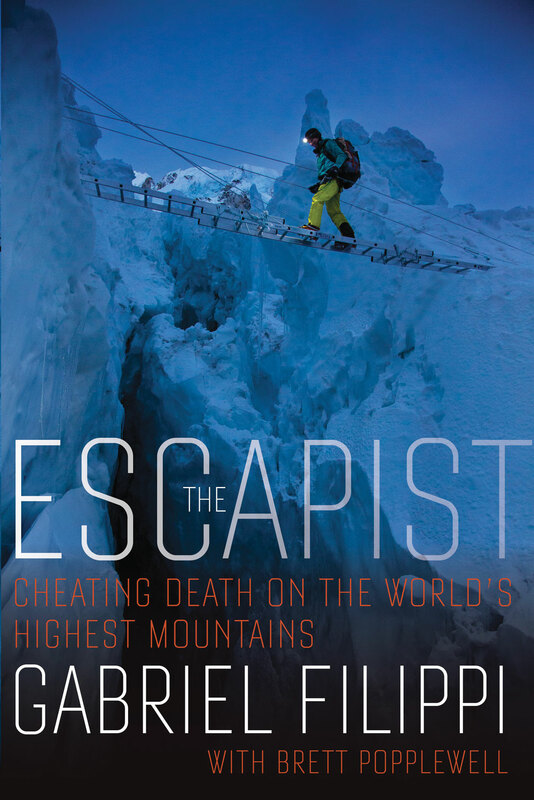 In his new memoir The Escapist, Filippi recounts the extreme adventures and devastating tragedies that he's experienced over the past two decades. Through stories from K2 to Everest to Nanga Parbat (a mountain in Pakistan known affectionately as The Maneater), he examines what it takes to reach the top of the world, and what you're left with on the way down. Below is an excerpt from the book, wherein Filippi writes about being on Everest in April 2015 when a 7.8 magnitude earthquake hit Nepal, causing the deadliest day in the mountain's history. The earth shakes and I hear the distant roar of an avalanche coming near. It sounds like a freight train rolling fast toward my tent. I know immediately that I’m not safe inside my canvased dome, that it will be wiped away by the snow or ripped from its moorings and tossed into the air. The wind is deafening and getting louder as I get to my feet and break outside into the open. Everest Base Camp sprawls out before me; people are scrambling in every direction, unsure what to do. The dog that has been following me around day and night, eating my food, and sleeping by my tent is already gone, and I don’t know where. A dark cloud of flying rocks and sheets of ice gather at my back, and I begin to run, straight for the icefall. I’m only a few steps from my tent when I spot some client climbers trying to film the cloud on their cellphones. There’s no time to say anything more. I hunch my back as I run, trying to keep my head low as chunks of ice and rock strafe past me like bullets. I’m not far removed from my tent when I lose a shoe. I’m running awkwardly now, increasingly aware that I’m not moving fast enough to escape the cloud of snow wrapping itself around me. Then I spot a boulder at least five times the size of my body and begin sprinting for it, just as a gust of wind hits me in the back and lifts me from the ground. For a moment, it feels like I’m flying. Then I catch up to the boulder and force myself into the eddy behind it. I crouch in the fetal position and shut my eyes while rocks and ice smash against my newfound shield. I try to scream but I can’t even breathe. A jet of air rushes into my mouth and nostrils as I struggle to inhale. The freight train is running over me now. I’m suffocating. It feels like forever, though it’s only forty seconds. I can feel the snow accumulating on my face and body. I remain as still as can be. Then the roar begins to pass me by. Soon it’s just a distant rumble, and then it’s gone and everything is quiet. I cough snow, ice, and dirt from my mouth and keep on coughing until finally I can breathe. I open my eyes, brush the snow from my face and body and check myself for blood. There is none. I rise to my feet and take a desperate look around. I can’t see a thing. I can’t hear anything either. And in that moment, it seems I’m completely alone. The blinding whiteness begins to thin and I get my first glimpse of the extent of the destruction. I’m standing in the aftermath of the deadliest disaster in the mountain’s history. I’m unaware that down in the villages and streets below, more than eight thousand people have just been killed. Right here at base camp, ninety bodies lie twisted and broken, eighteen of them beyond repair. I begin running again, moving as fast as I can toward my tent, to the first aid kit I keep in a pocket next to my bed. On the way, I come upon my shoe; it’s full of snow. I pick it up and shake it out. I have no sooner got my foot in my shoe than I hear the first people screaming. They aren’t crying for help; they are screaming incoherently from every direction. I continue to my tent, grab my kit, and spot Sylvie in the distance. She’s on her feet, looking startled but moving back to her tent as well. I yell out to her, asking her if she’s okay. She says she’s unhurt and that she’s gathering her medical gear. I throw my kit under my arm and head back out into the mess. The white cloud continues to clear as I run, revealing an apocalyptic scene of shattered tents, destroyed bodies, and blood-soaked snow. At the moment, I think only of Elia. I begin running toward his camp, fearing that he might not be as lucky as me. But I take only a few strides in Elia’s direction when I find myself turning instead toward what seems the nearest voice calling for help. It’s a woman’s voice screaming loudly from somewhere out in the snow. I’m still running toward that voice when I start to notice broken tents filled with broken bodies wrapped around boulders. In every direction, I can see snow marked by the blood of the injured. I come upon a Sherpa lying on his back in the snow, breathing heavily and clutching at the ground with his hands. A demolished tent lies beside him, as does a bloodied rock that has flown through the air and taken off the left side of his face. His skull is open, his socket crushed, and his left eye completely exposed. He spots me with his one good eye, and in it I get a glimpse of pure shock, desperation, and momentary hope that my arrival might save his life. I crouch in the snow by his side, place his hand in mine, and try to speak to him. He doesn’t reply, and I get the horrible feeling that there’s nothing that I or anyone else can do to help him. I focus on his one good eye. He looks at me, and even though there are no words coming out of his mouth, his eye is begging me to save him. A soft and weakened gurgling noise emanates from his throat. He’s still breathing, and I tell him to hold on, that help is coming. But when I look around, there’s no one else in sight. He stops gurgling and I see his eye starting to lose its focus. I worry he’s about to die in my hands. I’ve seen a lot of crazy things in my life, but nothing has prepared me for this moment. I don’t know what to do, so I continue trying to talk to him. I don’t know how many times I repeat that line before I pull my focus away from his eye and look up. I want to yell but I know there’s no point. I look around at his clothing to see if I know him. I can’t tell by his face if I’ve climbed with this man, sipped tea by his side, or shared a laugh with him in one of the dining tents here at base camp. His face is so badly damaged that I doubt his family would recognize him. I’m by his side for two, maybe three, minutes when the little sound from his throat stops. He’s no longer breathing. I squeeze his hand, tell him again to stay with me. It’s no use. I feel for his pulse and it’s gone. I stare at his body for a few moments. My eyes well up and there’s nothing I can do to stop the tears. I brush them from my face and begin acting on impulse. I grab the sleeping bag lying in the bloodied snow next to his body. I unzip the bag and place it over him to preserve his dignity. There’s no time for prayer or reflection. I hear more screams coming from other parts of the camp, and I feel I should be running again. I head south, making for the nearest, loudest cries for help. I overhear on the crackle of a passing radio that Elia’s camp has survived the earthquake. I’m relieved, but only for a moment. I look around me and notice I’m standing in the smashed remnants of the Adventure Consultants’ camp. It’s a mess of ruined bodies and red-splattered snow. There’s a tent, belonging to a married couple I’ve climbed with before, collapsed and destroyed under the weight of a boulder. I search around it for the bodies of my friends. They aren’t here and I begin to fear they may be somewhere up the mountain. A dozen or so people are scattered about. Some are dead while others are halfway there. Barely five minutes have passed since the earthquake. I see uninjured climbers trying to stop the blood pumping out of a man’s twisted body. I see another man lying alone. I don’t know the injury he’s suffered, but I can see that he’s too far gone to warrant anyone’s attention. In this particular place at this particular moment, the injured outnumber the uninjured, and decisions are being made about who can be saved and who will be left to die. I crouch by the man’s side and grab his hand, just as I did the Sherpa’s a few minutes earlier. Again I focus on his face. Shock has set in and I’m no longer sure that I’m functioning. I look into his eyes. His head is as bloodied as his body, and I can tell he isn’t going to make it. I know there’s nothing I can do but be here with him when he dies. I tell myself that at least that’s something. I don’t think anyone wants to die alone. So I kneel in the snow and ask him to stay with me and talk about his family, while I cling to an irrational hope that if I can convince him to keep breathing, maybe, just maybe, he’ll be okay once proper help arrives. I know, first-hand, how climbers can sometimes keep themselves alive by thinking about their families. I remind this man that he too has a family and that he should think of them now. I want him to live, and I tell him that his loved ones do too. He makes no noise as I speak Escapist interior.indd 335 8/24/16 11:23 AM GABRIEL FILIPPI 336 to him, doesn’t even blink, and I wonder if he’s already dead. I slip my finger onto his wrist and feel for his pulse. It beats faintly and sporadically against my finger for a minute, maybe more. And then it’s gone. I step back from his body, look at his face and then at my hands, which are covered in blood. I’m overcome by a sickening feeling that I’m useless. That I can’t save anyone. I stumble through the carnage, distraught and covered in blood, in search of Sylvie. I find her at her tent. She’s kitted out and ready to go. I want to grab him by the jacket and shake him or smash him. I don’t know what’s wrong with him until a half-hour later, when I spot him wandering aimlessly through camp. I wonder if he’s broken. All through the afternoon and into the night, I work under Sylvie’s direction, ferrying the injured on makeshift stretchers made out of ladders into a triage of hospital tents. We place the dead in sleeping bags and put them under a tarp that we designate as the morgue. It’s nightfall. I start for my tent, my mind filled with the faces of the dead. As I stare up at Everest through the icefall, the stars in the sky remind me that there are two hundred or so climbers marooned up above. I find myself questioning what any of us are actually doing here. On a day like today, when the earth moves, and the plate beneath India wedges itself a little bit deeper under the plate beneath China, Everest grows. It’s a deep realization that right now, the peak of the world may well be one step closer to the stars above. I pull my attention down to earth and look at the destruction that surrounds my tent. There is absolutely no damage to my campsite. And that’s when I cry. I ask what I’ve done to deserve this. A dog barks, and suddenly nothing else matters. I fix my eyes on the shadowy figure standing in the snow outside my tent. Another bark and I approach with my hands out. Someway, somehow, this dog has survived where sixteen men and two women have perished. I pat his fur, then look into his face. He strikes me as oblivious to the horrors of the day. Then I crawl back into my tent, place my head on the pillow, and think not of the dog, but of the corpses lying under a tarp in the makeshift morgue. It will be dawn before the choppers arrive to take the first few survivors down into the valley below. I kick my shoes off but keep them near as I crawl into my sleeping bag. The earth is restless. I close my eyes. The faces of the dead reappear inside my head. I already know I won’t be getting any sleep tonight. I turn my headlamp back on, reach for the Ziploc bag of sacred rice in the top of my knapsack, clutch it in my hand, and lie awake in the cold and the dark.